Tien-Mou/Taipei City. 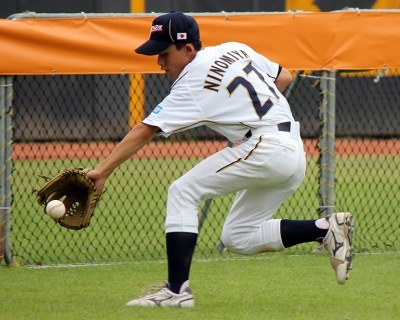 Japan remains its keep slate at the II 12U Baseball World Cup with a 5-4 victory over Mexico in their final first round match on Thursday afternoon at Tien-Mou Stadium in Taipei City. However Japan needed a two-out walk-off RBI single in the bottom of the sixth to keep Mexico out of victory lane. Both teams already were qualified for the quarterfinals. In the beginning it looked like a lopsided win for Japan. Daichi Aoki and Tomoharu Moriya hit back-to-back home runs in the bottom of the first to give them a 4-0 lead. Afterwards though Japan’s offense was shut down and weren’t able to do anything against Mexican pitching. This allowed Mexico to get back into the game. A wild pitch in the third and an error in the fourth helped them to cut the deficit to 2-4. In the sixth Hector Vargas tied the game with a two-out, two-run double. In the bottom half of the sixth, Japan led off with Tomoki Ouchi, who reached on an error at short. A sac bunt not only moved him to second but all the way to third. Following a strikeout for the second out Koyo Mizushima ended the game hitting a 1-2 pitch off Kevin Garcia through the middle for a walk-off single. On Friday Mexico will face Venezuela in the quarterfinals. Japan will square off with Panama in the afternoon. Both games will be played at Tien-Mou Stadium. SAWAMURA(2). SB - NINOMIYA(7). CS - NAKAJIMA(1).